Sebastian woman runs around the Sebastian Inn and Suites completely naked and throwing household items out of the motel room. SEBASTIAN – A manager at the Sebastian Inn and Suites called police about a woman running around completely naked and throwing items from the balcony, according to the Indian River County Sheriff’s Office. The incident occurred yesterday at 6:07 p.m. when the Indian River County Sheriff’s Office was called about a disturbance between and man and woman at Sebastian Inn and Suites located on U.S. Highway 1. Upon arrival, deputies noticed several household items were thrown from the balcony and onto the walkway from one of the rooms. The deputies made several attempts to make contact with someone from within the motel room. Then they heard a woman who sounded extremely intoxicated where they could not understand her. 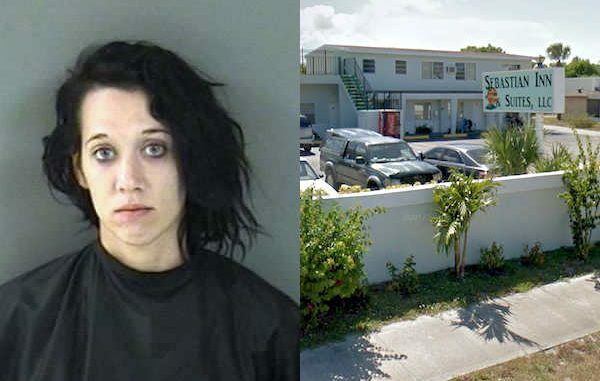 “When asked why there was household items on the balcony and on the sidewalk… she stated she was crazy which was why she was throwing items out of the motel room,” the deputy said. The woman was identified as 25-year-old Tiffany Fricke of Sebastian. Deputies finally made contact with Fricke and detected a strong odor of an alcoholic beverage emitting from her breath. There were several people standing outside of their rooms to investigate where all the noise was coming from, according to the report. Fricke then yelled out profanities to the property manager and her boyfriend in front of families with children as they were walking in the parking lot. Deputies warned Fricke to stop yelling or she would go to jail. Moments later, Fricke started yelling profanities again. Fricke was detained and placed in a patrol vehicle while deputies continued to investigate the incident. “With the back windows down, Tiffany repeatedly yelled out expletives and began to kick and banged her head” on the cage to the patrol vehicle, according to the deputy. Deputies warned her several times to stop kicking, but she continued to do it again. “She was then placed in the back of my patrol vehicle where she again kicked and banged her head on my cage. At which time, I placed a hobble restraint device to Tiffany’s legs,” the deputy said. Fricke was arrested for disorderly conducted and transported to the Indian River County Jail. On the way to jail, with the back windows down, Fricke repeatedly used profanities towards the deputy and passing motorists while banging her head on the cage. She also spit all over the backseat and floorboard.